Knock Knock Contemporary Artists’ Initiative presents SUB-O–The Affordable Art Show, highlighting 30 of Far North Queensland's most collectable contemporary artists. Paintings, prints and sculptures will be among over 150 works – all priced under $1000 – on display from 7 November at Tanks Art Centre. Now in its fourth year, the annual exhibition is an experimental platform, which gives professional artists from the region the chance to release new work and to explore fresh ideas within their practice. ‘Bigger and better than previous exhibitions, the new format of the 2014 show challenges participating artists to create new works in series, with each artist given their own space within the Tanks Art Centre,’ says Project Coordinator, Rose Rigley. ‘For the first time, the artists' works have been catalogued for viewing and purchasing via an online platform. If you are after an affordable piece for your collection, you should get in quickly!’ suggests Rigley. Artists include Robyn Baker, Rick Beresford, Raewyn Biggs, Justin Bishop, Mollie Bosworth, Kylie Burke, Adam Cusack, Louisa Ennis-Thomas, Vide Freiberg, Margaret Genever, Andrea Huelin, Elizabeth Hunter, Ed Koumans, Pam Kusabs, Claudine Marzik, Julie McEnerny, Laurel McKenzie, Arone Meeks, Tijn Meulendijks, Bek Misic, Caroline Mudge, Roland Nancarrow, Julie Poulsen, Fiona Price, Rose Rigley, Steve Royster, Kristin Tennyson, Ian Tunbridge, Jennifer Valmadre and Nickeema Williams. 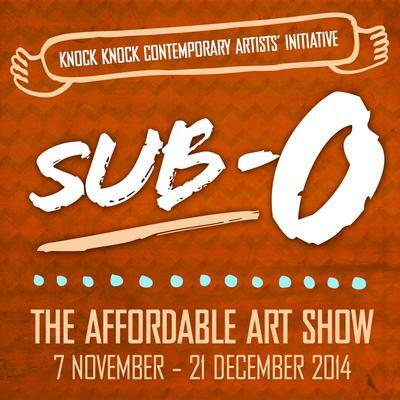 The official opening for SUB-0–The Affordable Art Show will be at Tanks Art Centre on Friday 7th November from 6pm. Musical entertainment will be provided by singer/songwriter Alex Blagojevic. All are welcome! The exhibition continues until December 21.